"Five thousand years ago, a man perished in an Alpine mountain storm. In 1991 his frozen body was found along with artifacts of his vanished way of life. The program covers the international effort to unlock the secrets of this astonishing discovery." the grass in the shoes is only found at an altitude of 10,000 ft.
first estimate was that The Iceman was from the European Early Bronze Age, or, ca. 2,000 B.C. 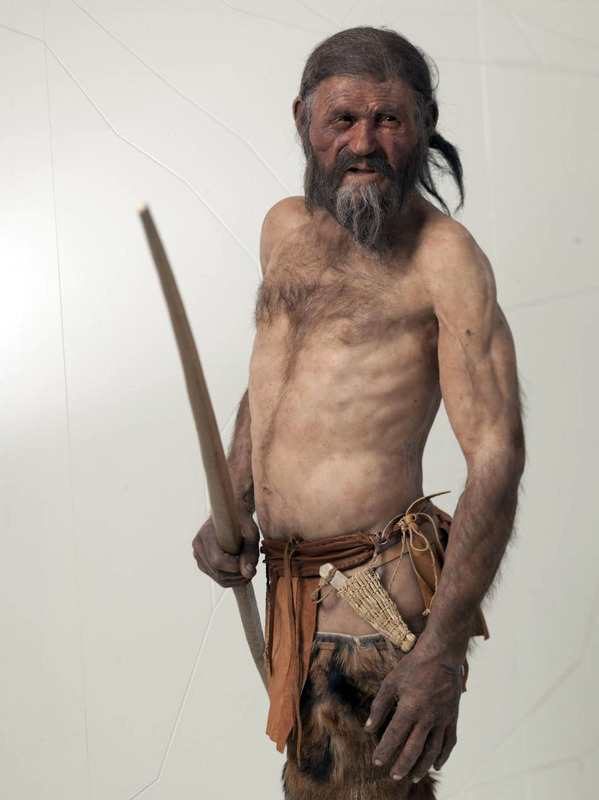 axes like "Ötzi's," with flanges, usually date to 500 years later, "in the Copper Age"
"The discovery in the Alps of a 5300-year-old corpse, perfectly preserved by five millennia of ice, allowed a rare glimpse into the daily life of Stone Age man: his diet, his clothing, and way of life. This program follows scientists and archaeologists as they analyze his hair, clothing, and stomach to uncover clues to how our ancestors lived and died. The program offers a fascinating glimpse into one of the archaeological finds of the century."